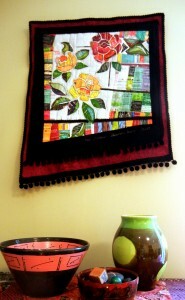 In honor of Mother Earth, I just added a new piece to my ReUSE series. 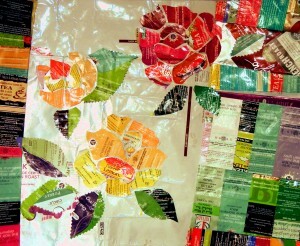 I don’t know how long I’ve been stalking the idea of a Tea Roses piece, that is, roses made out of tea bag envelopes. Last year, I took lots and lots of pictures at a rose garden in Florida. Then, meaning to get rid of one horrid picture of me, I mistakenly deleted all my shots. That’ll teach me to put on my glasses when reviewing my shots! Starting again, I found a photo of a yellow rose that I cannot now find–I think it is one of Sammie Moshenberg’s lovely images. 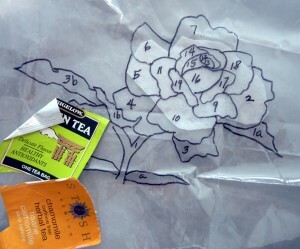 I traced the picture, numbered the pieces, and prepared to do a cut and glue sort of applique with tea bag envelopes. The “kit” of materials I assembled sat by the TV for months. Turned out this method that was waaaay too complicated for me. I’m more of a slap-dash kind of quilter. Last week, an online quilt class taught by the extraordinary Pamela Allen of Canada featured an assignment for a fantasy fabric garden. That was the impetus to go back to my Tea Rose project once again, and substitute my trash stash for fabric prints to dash off some flowers. 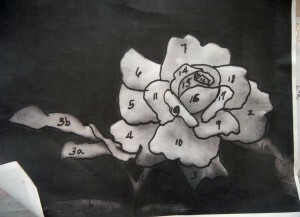 Following the lead of my sister students, I cut petals freehand, and worked in rounds. In this series, I simply adhere shapes with glue-stick over patchwork. White bags that once held ground coffee gave me bigger pieces and a quiet background, too. 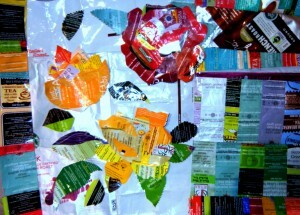 I cultivated plots of assorted tea bag and coffee packaging to sort of fence in my garden. Due to the foil-lined packaging that holds a crease, I was able to fold back some of the petals like a real flower. But even with the silver backing peeking up, the flower heads looked too dense, and the petals weren’t readable as separate shapes. Back to the drawing board, I tried out an open design, like an arts & crafts style stencil or stained glass design. Better! Then on to layering over woolfelt (wool and rayon blend), preshrunk for a thick, sherpa-like quality. Quick quilting and trimming with passementerie and ball fringe gets everything sown so I can reap the rewards before Earth Day ends! My garden is a bit messy, and even though the bottom edge is angled, the whole thing should still hang straight and true. Not the case, not even close. But as they say, DONE is better than perfect. Hope everything’s coming up roses for you! And that you ReUSE, RECYCLE, and REPURPOSE trash or found objects to REDUCE your carbon footprint. 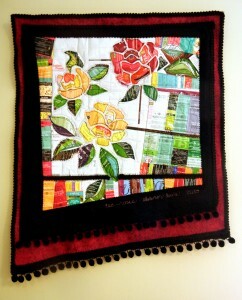 Oh, and RECONSIDER the many ways of creating quilted art! 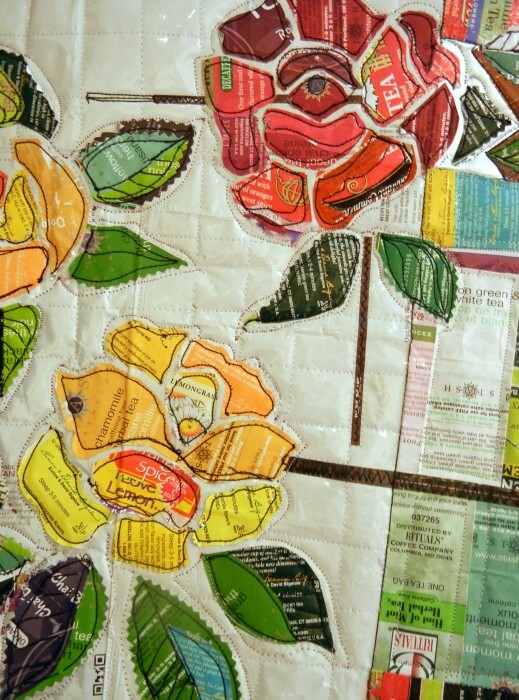 This entry was posted on Tuesday, April 22nd, 2014 at 9:21 pm	and is filed under Art + Quilt, Flowers, Inspiration, Recycled Art, Uncategorized, Unusual Materials. You can follow any responses to this entry through the RSS 2.0 feed. You can leave a response, or trackback from your own site. Good for you to finish this…I really like the striped borders on the left and bottom! And I really like the angled bottom edge. I love how this turned out. Great idea to back it with the felt. Genius! I love the slant – it’s the icing on the cake! And the danglies! I think this could be another kit/class!